I guess everyone has their favourite stories about experience at the Post Office. It’s a tough business and it’s sad to see them struggling to develop new business models, but change is inevitable. The Austrian post office branch near us just closed since the Post decided to sell the building so it could be converted to condominiums. It’s a beautiful Jugendstil building. 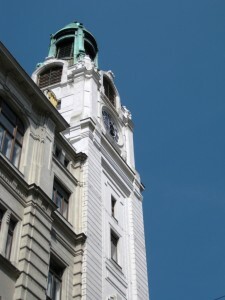 The photo above shows the tower. The building is on the corner of two narrow streets so it’s hard to get a good photo. It’s sad to lose a convenient post office but I can sort of understand the need to sell valuable property, although it’s another loss for the public realm. They remodelled the Post Office portion of the building around the time we arrived in Vienna. They added a store selling office supplies, telephones, computers etc. that you needed to walk through to get to the post counter. The funny thing about the remodel was that they did not add the simple queuing principle of one line for all open counters which you see almost everywhere now. So it was roulette as to which line would move fastest. I tried to take a photo of this chaos but it isn’t allowed because the Post Office in Austria also is a bank. After about two years they changed to the one-line approach, but the funny thing was that many people tried to skip through and pretend that they did not see the signs for the new system (especially women of a certain age!). I have to say that the Post Office workers were generally really good about this and sent the queue-jumpers back. Anyway, the point of today’s story is that I bought a box of envelopes one day from the Post.AT own label. Today I went to the post office to mail a letter with one of these envelopes and it cost 6.80 Euros, that’s close to $8.80 for a very light letter to the USA. I was a little surprised and asked the person why it was so much. She showed me the sizing-chart that is on the scale for weighing the letters. The envelope is about 2 millimeters too large in width and height to qualify for the 1.70 Euro rate! I did not know whether to laugh or cry. 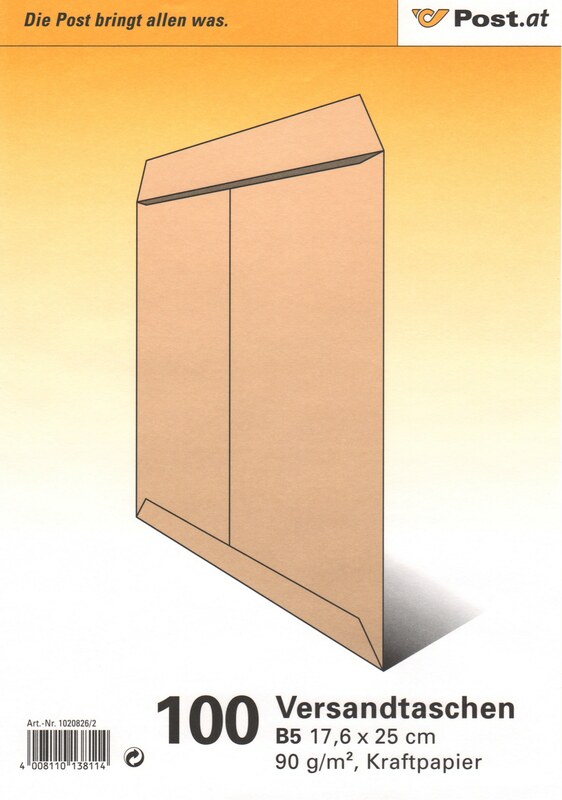 So, is it smart business to sell envelopes that make customers pay 300% more to mail something? Or, will it just piss us off and encourage (even) more people to use alternatives to the post office? I know which camp I am in. 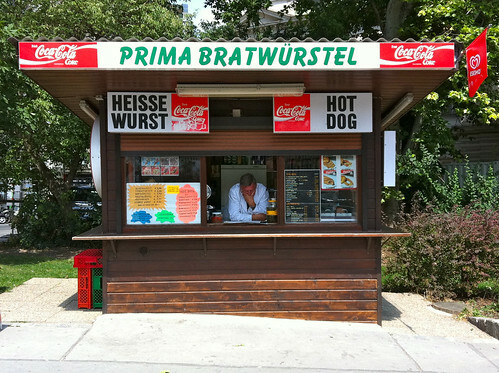 Wurst stands are ubiquitous in Vienna. I see this one everyday on my streetcar trips “downtown”. I took the photo last Friday, it was hot and the chef was so relaxed it just seemed like a perfect opportunity. Ironically, after posting the photo I had wurst for lunch at the airport and then wurst for dinner at the city hall reception given for the Cities for Mobility Congress in Stuttgart. It was a great reception with lots of international guests. The mayor spent the entire evening there talking with us and enjoying the great local hospitality. 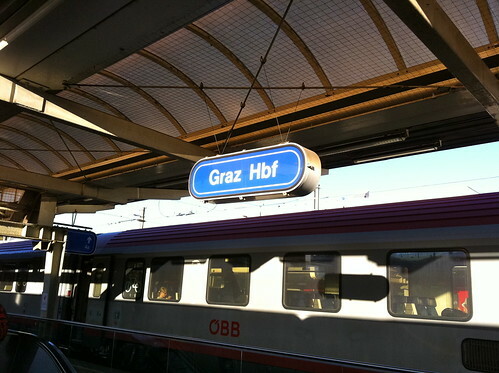 Since my wife is from Wolfsberg Austria (Carinthia) we travel frequently through the Graz Hauptbahnhof on our way south. 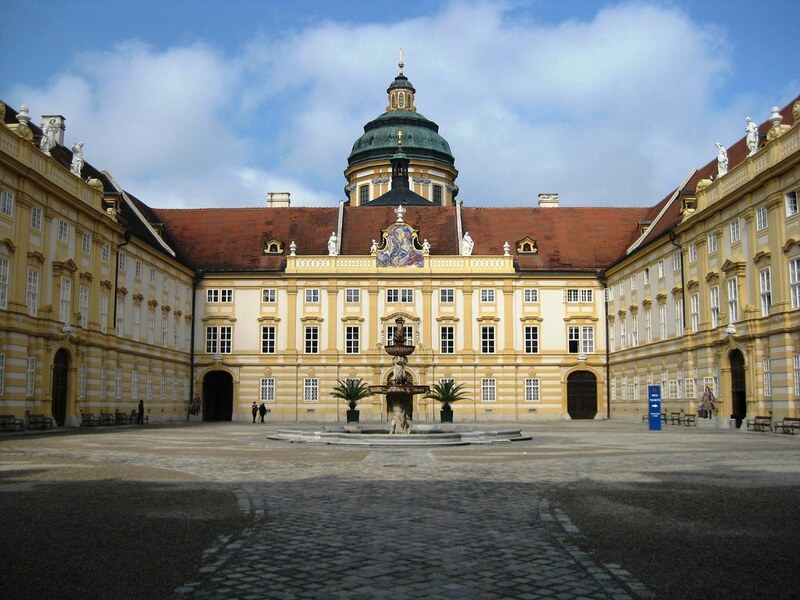 There are hourly trains from Vienna to Graz, but then the fun begins. There is no train service between Graz and Wolfsberg, but there is an “Intercity Bus” which is not bad, about an hour nonstop between the cities operated approximately every two hours. Unfortunately the bus and the train schedules are almost perfectly uncoordinated. 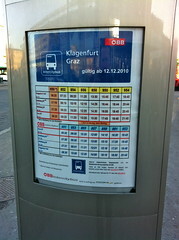 The bus from Wolfsberg (and Klagenfurt) is scheduled to arrive one or two minutes after the train to Vienna leaves. So you need to hang around in Graz Hauptbahnhof for about an hour. In the other direction many of the buses also require a long wait (Friday we waited 57 minutes, since the bus leaves 3 minutes before the next train from Vienna arrives). Perhaps the reason for this sloppy scheduling is that the buses used to leave a few minutes after the train from Vienna arrived. If the train from Vienna was at all late you missed your connection – then it’s almost two-hour wait until the next bus. The new system allows the train to be almost an hour late and you can still make the bus. Another problem with the bus is that it is frequently overbooked at peak travel times like Friday and Sunday evenings. We were lucky last Friday and they put another bus into service, but we have also been forced to drive to Graz because the bus is full. You may think – like the sign at the right says – “Missed your train? 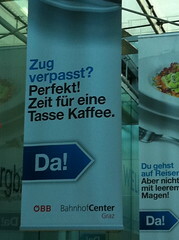 Great, you can have a coffee at the station” – but I don’t know many people who think “Great” about missing their train. Yes, it is great that the station has restaurants and shops, but my goal is to get somewhere not to spend time in the station. Oh, and one more thing as long as I’m ranting. You need to pay to go to the restroom in Graz! Why can’t railway stations – especially railway stations with shopping centres – have free restrooms? I can’t think of an automobile-based shopping centre that has restrooms where you need to pay. I understand that railway stations seem to attract people with social problems, but deal with the problems, don’t make everyone pay. (Especially if you have restaurants serving coffee and beer!) 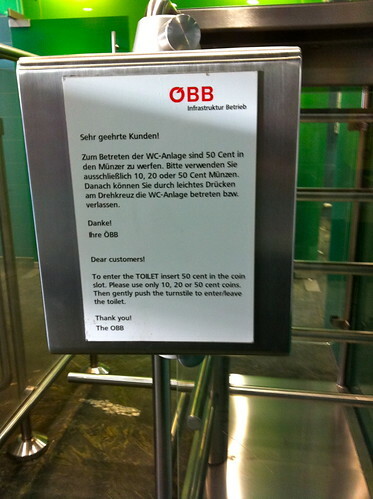 By the way, the problem is not unique to Graz, they also charge for the restrooms in Vienna and Zurich. This kind of sloppy scheduling and lack of attention to providing basic customer amenities causes people to drive. Why put up with the hassles of railway travel? Poor service is especially dumb on this route because the Austrian government is spending about 4 Billion Euros on a tunnel that will replace the bus with rail service; they should be doing everything possible to build up demand on this route so that when the tunnel is finished people will be used to taking public transport. Instead people like us will probably have bought a car since the drive from Vienna is about 3 hours and the train takes 4 and a half hours with the bad connection. MuseumsQuartier Vienna from my flickr photos. 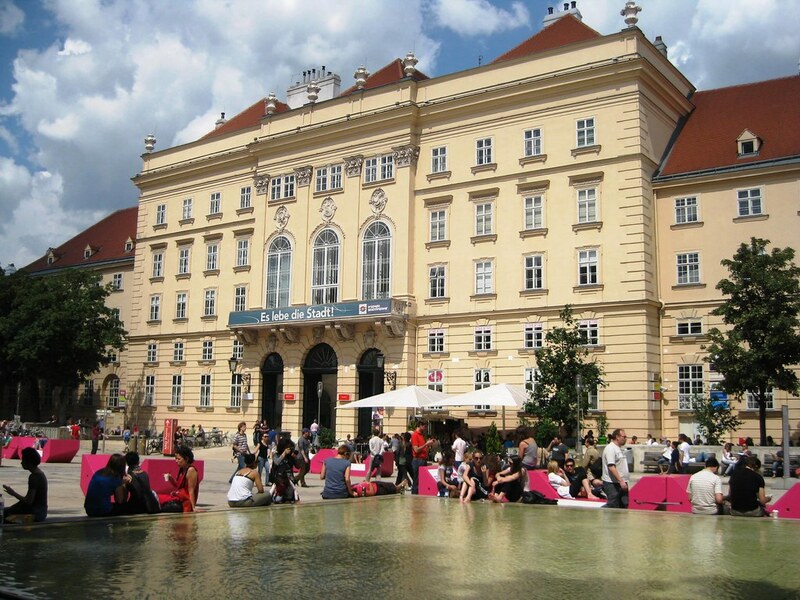 We held our Vienna Linchpin Meetup at the MuseumsQuartier. The highlight was meeting a group of people who wanted to discuss Seth Godin’s ideas. On the way home I was amazed to note that three hours had passed, although the fact that they pretty much had to throw us out of the cafe should have been a hint. We discussed a wide variety of subjects, listed below. We decided to meet again in September to continue our discussion with more people. Can cleaning people be linchpins? We think that it’s possible to bring art to cleaning and cleaners can be an important connection between people working in an office. Our model is not the outsourced cleaning companies, but rather the cleaners who were really part of the organization, like the janitors in our elementary schools in the old days (Mike Mulligan of steam shovel fame). Maybe not forever, but being a linchpin cleaner (to pay the bills) while you are doing some other art at night. How do you transfer Seth’s ideas to old businesses and institutions? An especially important question in cities like Vienna with long traditions. Can you be a linchpin in a large business or do you need to work for yourself? Of course Seth discusses this, but it was on our minds. We felt that learning to get along in existing structures can provide you with the freedom to implement innovative ideas. But, it’s a balancing act. We should always ask, “Where’s the fun?” at work. Work should be a playground where you can fail. Interestingly some organizations allow failure but sweep it under the carpet preferring to ignore it rather than learn from it. What about colleagues to whom work is simply 8 hours plus a paycheck? Finally, as a mixed German and English speaking group, we had a lot of fun translating and debating how to interpret Seth’s work (starting with “What does linchpin mean?”) in another language. Rivets are not just for frogs! One of my civil engineering professors at RPI used to always talk about the ‘built up’ columns in the New York City subway stations. The “I” beam shape is very strong and efficient, but it was impossible to make “I” beams directly before the 1908 when a man named Henry Grey invented a mill machine that could roll the shape. So steel workers needed to build their own “I” beams in the field by joining steel plates with rivets. 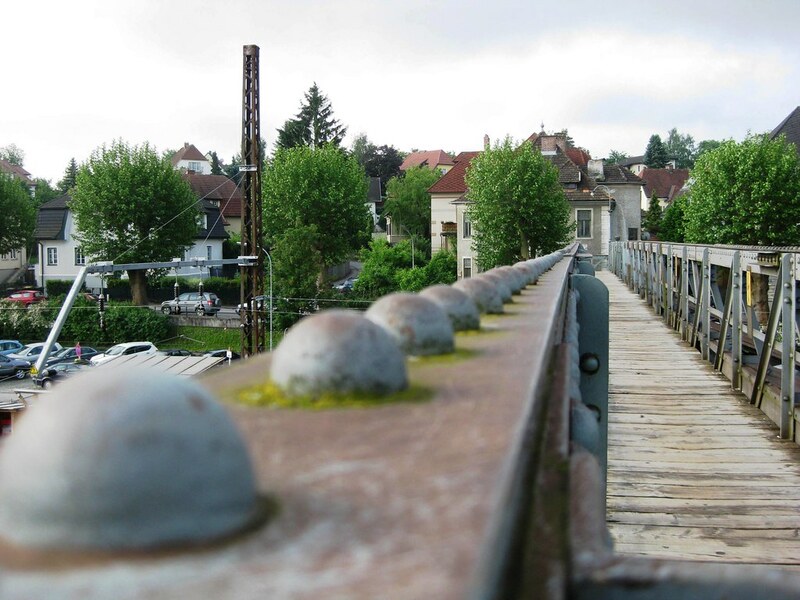 I was reminded of my civil engineering studies when I visited Melk last week and used the pedestrian bridge to cross the tracks. By the way, Grey worked for Bethlehem Steel, my first employer after graduating from RPI. I actually worked in one of the original “Grey” mill facilities in Bethlehem. 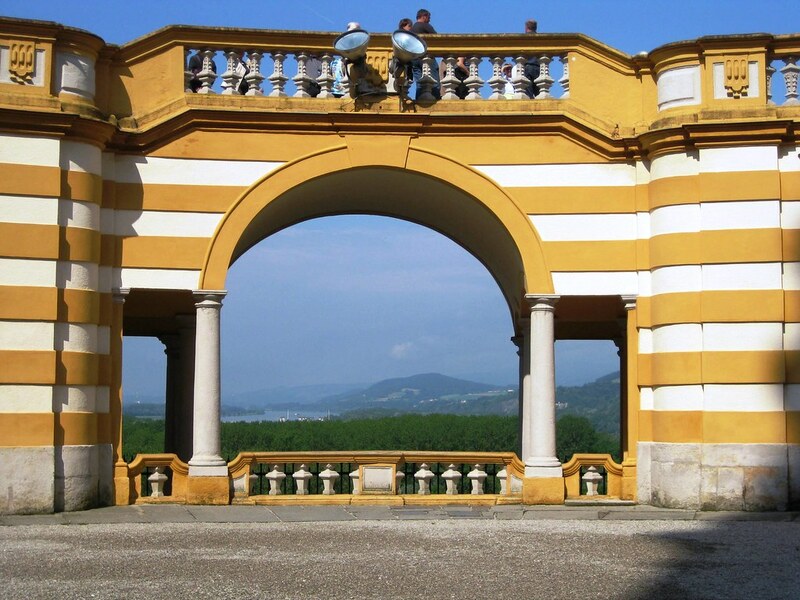 The Benedictine Monastery in Melk is a UNESCO World Heritage site about 90-km from Vienna so I wonder what has taken me so long to get there. 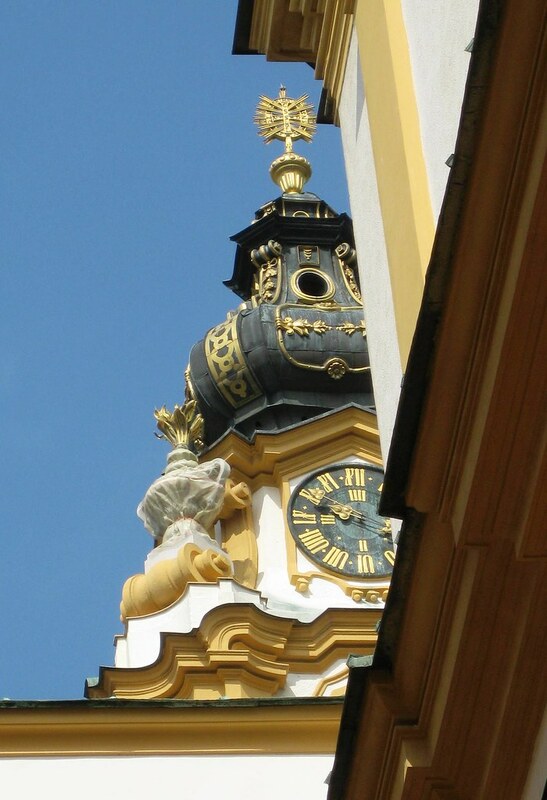 All photos are from my flickr set Melk Monastery (lots more photos there!). I went into the museum where the guard marked my ticket so that I could go in again with my scheduled tour. Even at this early hour there were many groups of visitors from Danube river tour cruise ships (Melk is located on the Danube and is a popular stopping point for river cruises). By staying in between the tour groups I had the museum rooms to myself for a few minutes. It’s a very interesting exhibit of the Monastery history combined with the history of the Dominican order of monks. 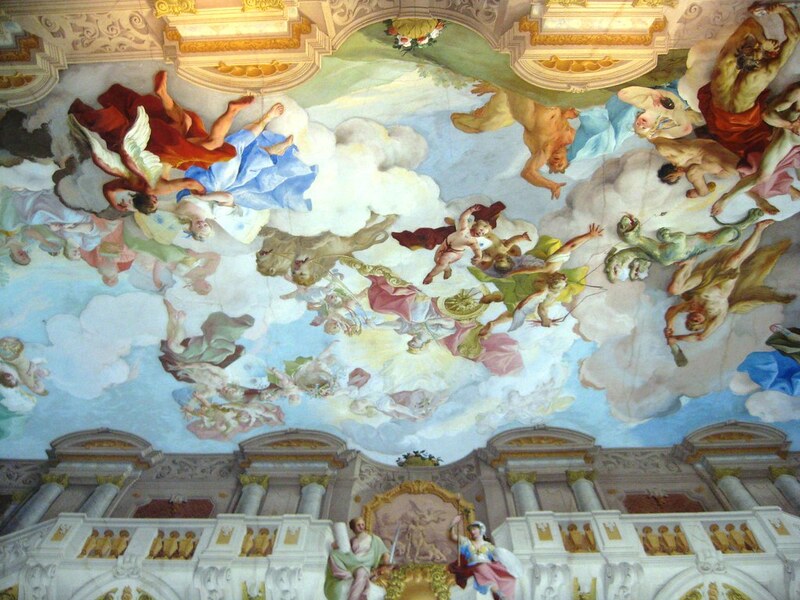 At the end of the museum is the marble hall which has a beautiful trompe de oeil painting of main characters from Greek mythology on the ceiling (most of the marble is painted stucco, by the way). Leaving the marble hall you walk out on a curved walkway overlooking the church on the one side and the Danube river valley on the other. 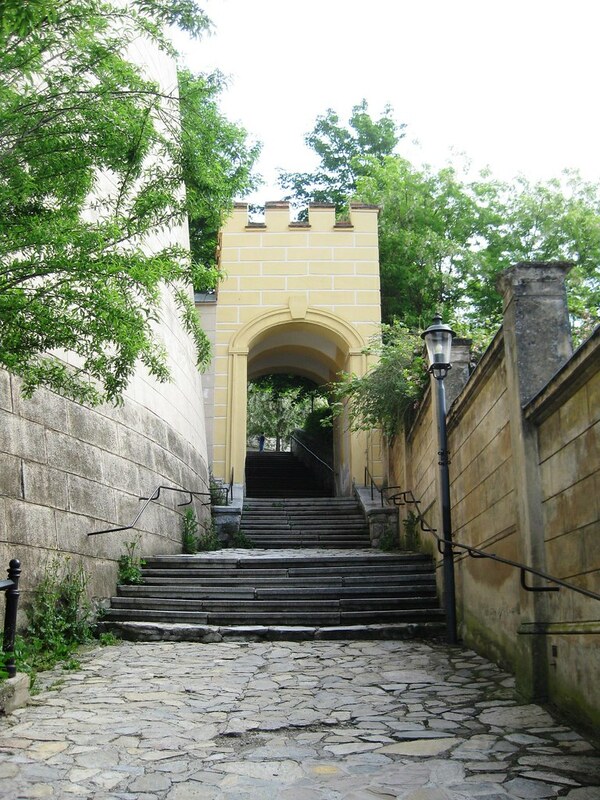 The walkway leads to the Monastery library, a treasure house of old books and ideas. Only two of the rooms are open to the tourist public, but the other rooms are accessible to scholars. A flight of circular stairs takes you down to the ground level and the entry to the church. 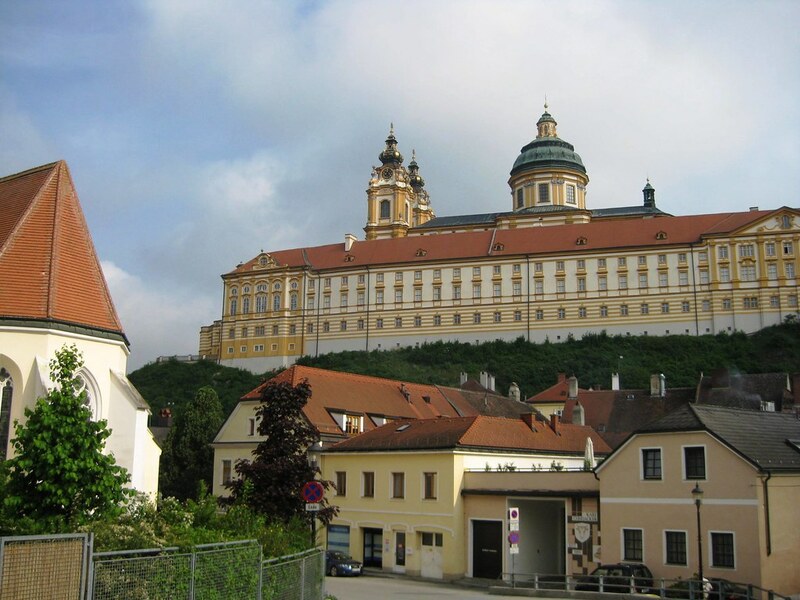 The Melk Monastery is famous because the whole complex was built at the beginning of the 1700s, and is all in the Baroque style. 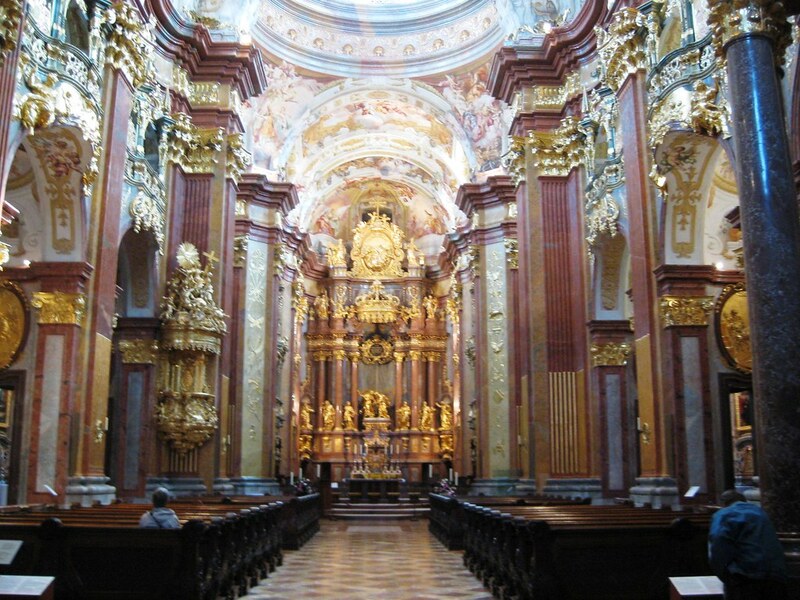 The church is where the Baroque really lets loose. It’s almost impossible to do justice to the space with a photograph. My early visit was quite nice because I was almost alone in the church (at 11:45 the church was almost full with tourists). 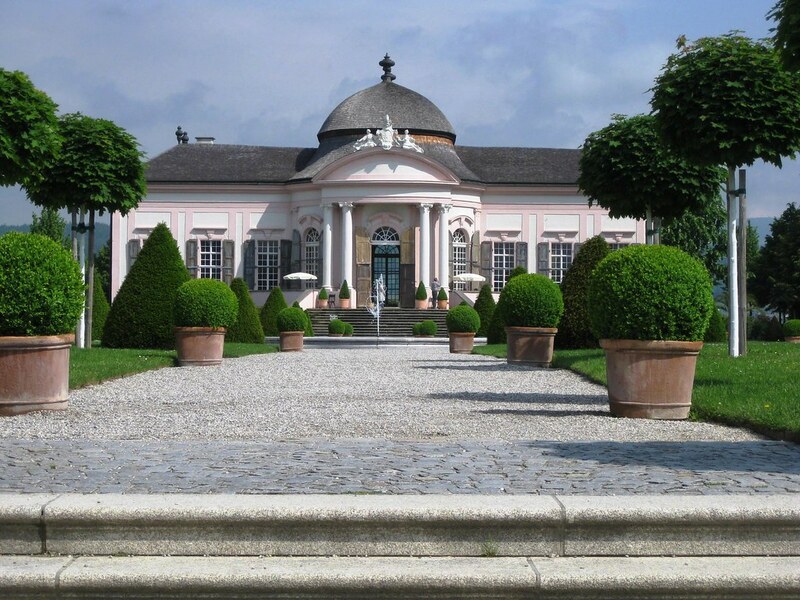 After leaving the church I visited the Monastery garden with its very nice garden lodge – cool frescoes – and took a walk down the garden path overlooking the Danube. Then it was time for my tour. The tour guide was excellent, he spoke very good English and knew his stuff. 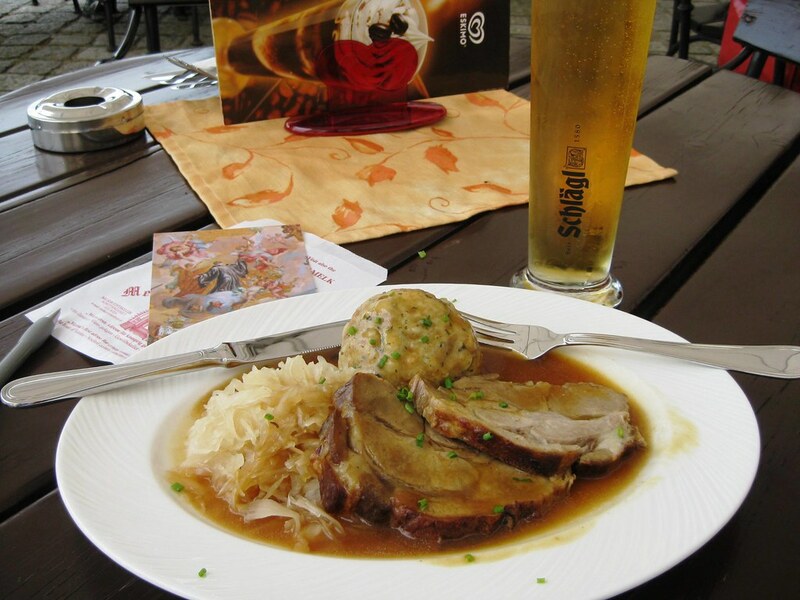 After the tour I was hungry and had a nice lunch of Schweinebraten and beer at the Monastery restaurant located just outside the main monastery buildings on the way to the parking area. The food was quite good and the service was very good (fast, friendly and efficient). My lunch cost 14 Euros.